In conjunction with the strategic plan that the board put together this fall, we are excited to launch the Lifelong Success campaign. In the following pages we will outline what the campaign entails and what our goals are with creating this. We’ve been fortunate as a chapter to have a very supportive alumni base. Through generous years of donation and work the chapter house has gone through a major remodel, a major landscape project, and lastly we are working to finish the parking annex this coming summer. I think I can speak for the board in saying thank you for helping us make this all happen. While top tier facilities are important to the overall fraternity we believe that our next step is to grow our endowment funds to build a sustainable source of funds for the future. Initially we have looked at the current scholarship program and are proud of the amount of dollars we are able to give. With this campaign we plan to not only increase the academic scholarship program but add new scholarships that reward the students in other areas such as leadership, and community involvement. We want our students to not only succeed in the classroom but also throughout campus and the community. Their collegiate success will lead to lifelong success and with the increase and addition of these new programs we want to reward these young men for their hard work. Below you will see the outline of our two endowments that we currently have. 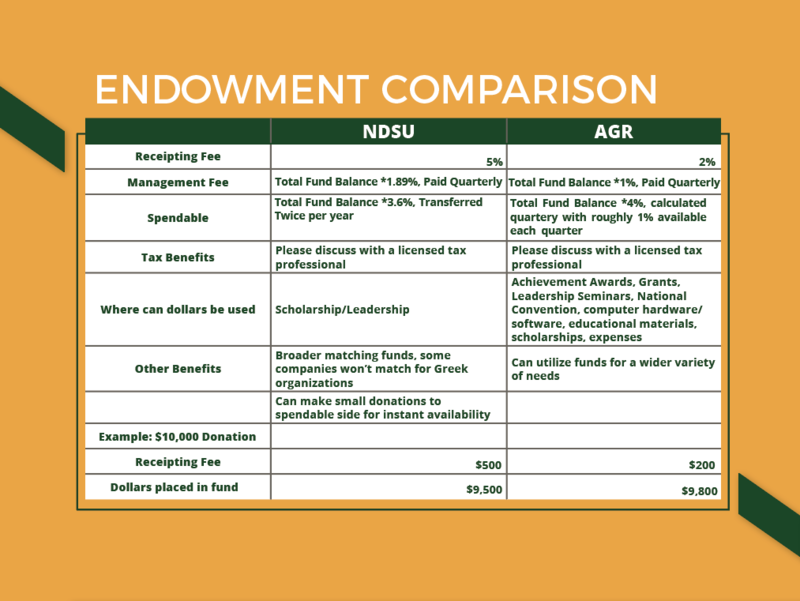 The first being the Epsilon Scholarship Fund at The Educational Foundation of Alpha Gamma Rho, and the second being the AGR Agricultural Leadership fund at the NDSU Development Foundation. You will see the current fund balances, in the following pages you will see a comparison as to the fees, as well as, the ways we can utilize dollars in each fund. After reviewing both funds in depth we feel that the two funds provide a great opportunity to meet our alumnus donation needs. If you have any questions on the differences between these two funds please feel free to contact the board and we can help answer your question or direct it to the correct personnel at either foundation.